Are you searching for that perfect space to devote to your painting in a beautiful, stimulating environment? 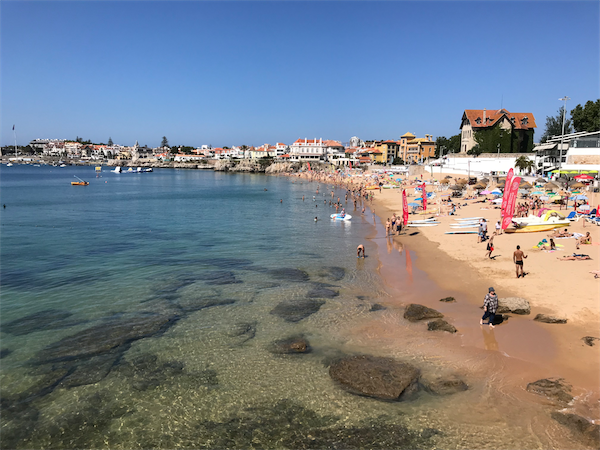 If so, come and join us at our workspace on Portugal’s spectacular coastline in Cascais where you can paint from early morning until sun set. We offer a perfect place for artists looking for uninterrupted creativity, enabling you to concentrate fully on your work without distraction. Naturally, the sea and the coastline are of particular attraction, but the area also offers many other opportunities for outdoor painting. This retreat is completely tailored to your personal needs; you can spend the whole day painting or you could just choose to paint in the morning and have the afternoons free to visit Cascais, Sintra or Lisbon. You could also join the Cascais monthly Open-air Painting Meeting, should it occur during your stay. We provide full transfers from the airport to your hotel and we will accompany you on any chosen tours, providing all the assistance you might need. You choose the hotel you would like to stay. We can make suggestions depending on your preferences. Cascais has a rich history and in the past was used as a retreat for many European Kings and Queens. It has a Museum Quarter situated in the centre with many beautiful museums and several examples of stunning architecture. Nowadays, it is a beautiful seaside resort where many Portuguese and tourists choose to spend their summer holidays. There are also many excellent restaurants in Cascais and Estoril where you will be able to enjoy the local gastronomy. Our programs have 3 or 5 nights. For other periods or groups (more than 7 people), please contact us. Afternoon - You will be completely free to paint where and when you wish to. There is a beautiful maritime view a few meters from the hotel, perfect to start you escapade. And you can also paint, photograph and sketch during our tours to Cascais and Sintra. An artistic retreat near the sea to focus solely on painting represents something of a dream for most artists. 09:00 to 12:00 - Transport and visit the iconic "Palácio da Pena"
However, if you would like to take part in any other tour to discover the beautiful surroundings during your stay, please inform us when you arrive and let us take care of all the arrangements. (*1) Tour of Cascais - Visit the historical center of the village, the Paula Rego House of Stories, Parque Marechal Carmona and the Marina. We will make some drawings and sketches during the tour. (*2) Tour of Sintra - Tour of Sintra - Visit "Palácio da Pena", tasting the famous traditional desserts, Azenhas do Mar, Cabo da Roca, the Europe's most ocidental cape and Guincho beach. (Optional) Tour of Lisbon - Visit to Torre de Belém, tasting the famous “Pastéis de Nata”, visit the Mosteiro of Jerónimos, the historical centre of Lisbon and some other highlights. I have read the " Terms & Conditions" and the " How to make a Booking" procedures. (1) our prices does not include accommodation, lunches, dinners, art material, flights or travel insurance.